by Walter Tevis, 1980, 280 pages. TLDR: 5 out of 5 for a wonderful concept, brilliantly executed, great character, and something to think about. This neat little social science fiction book pushes all the right buttons for me. It presents us with an extreme but plausible dystopian future in which humans have surrendered control of society to robots and survive the ensuing boredom by relying on mindless amusements and drugs. The de facto head of this society is a Mark Nine robot named Bob Spofforth, one of our three main characters, who has had enough and wants out. He'd kill himself if he could, but something is holding him back. One day he crosses paths with Paul Bentley, a mild mannered educator from Ohio who has taught himself to read - and nobody can read in this world! Spofforth (also Dean of the university) assigns him the task of watching old silent films and recording what the people say. Bob hopes to learn from this. But then Paul meets Mary Lou, and she's a marvel. Paul falls in love, breaking several proximity laws in the process, and so does Bob. Bob sends Paul to jail, and that's where Paul's education really begins! I loved the world painted here - it's dark in some places, absurd in others, and funny in others. It's always inviting you to question yourself and society at large. And it went places I didn't expect, to eventually deal with the nature of religion, companionship, self worth, the value of work, and the nature of love. In fact, love as a prime ingredient of humanity is what is ultimately at the centre of this book. This is the guy who wrote the book that Roeg based The Man Who Fell to Earth on. I think I have a copy of this novel, good to hear it delivers I'll have to dig it up. He also wrote The Hustler and The Colour of Money. He only wrote 6 novels, and 3 were made into very well regarded films. 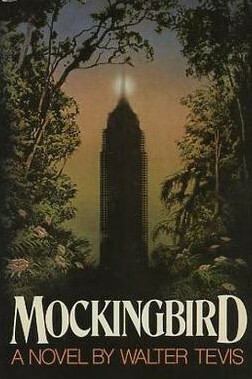 Mockingbird would make a great Terry Gilliam movie.